Le Fooding, the curiously named guide that has been documenting and reviewing the best of the city’s emerging chefs, is the bible of the movement, and served me quite well during my stay on more than one occasion. Next time you’re in Paris, download their app – it will tell you where the best restaurants are in proximity to your location – accompanied by a charming, albeit snarky, review. In homage to that publication, and because dining experiences can be hit or miss even in a great food town like Paris, I’ve summarized my favorite adventures so you can have a more delicious time during your next visit! A few notes before we begin. Most worthy bistrots require reservations for both lunch and dinner. Staying in an apartment has its advantages, but not having a concierge to bang the phones for you to snag a hot table is sort of a bummer. Most of these joints book up months in advance. Restaurants also have specific hours during which you can call, making it quite difficult to make reservations well in advance from the US or while you are out and about doing your thing in Paris. Finally, there is no such thing as Open Table here. Oh, the humanity! As a result of such challenges, and my predominantly single diner status for much of the trip, I limited my choices to places where walk-ins are welcome, which mostly meant the wine bar offshoots of the flagships of the more famous chefs. Regardless, you can get a more affordable and just as delicious meal, without the commitment of a multi-course pre fixe, a better option in my opinion. I’m also only going to wrap up restaurant dining here – StreetMeat will be covered in a separate post. Now, without further adieu, on to…Le Fooding! The neighboring wine shop and epicerie offshoot of the new, and already famous Spring Restaurant (6 Rue Bailleul) and home to the wonderful Spring bouillon, pictured above. 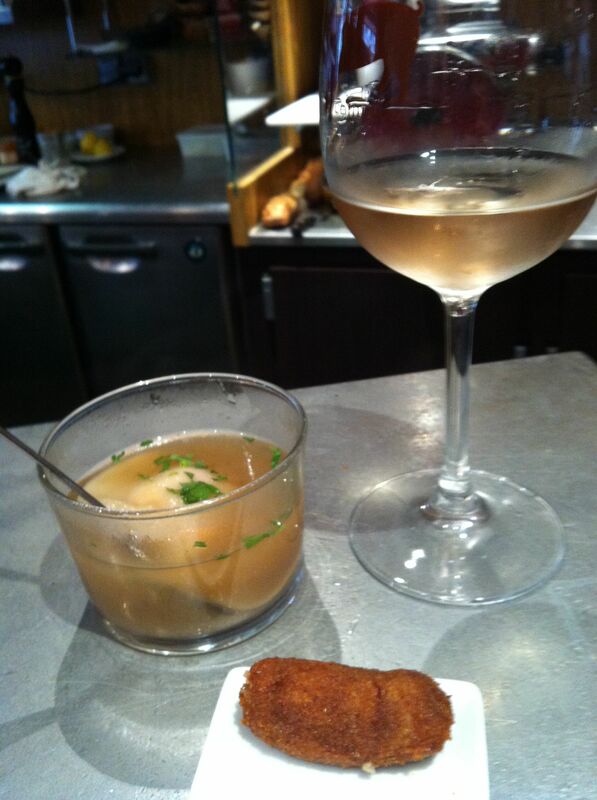 If you can’t secure a table at the tiny flagship, or if their basement wine bar is packed to the gills (as it often is), head to the shop for lunch to get a crash course in their market driven menu and have them recommend a couple wines to go along (you will need at least two glasses to finish the soup!) The chef, Daniel Rose, and sommelier are both American, so English speakers are welcome! Also, if you want to learn more about French wine, especially the natural and “biodynamic” wines that are becoming more popular here, try the Grand Tasting on Wednesday, Thursday or Friday afternoon. 60 euros for six wines (healthy pours too! ), plus charcuterie, cheese, bread and a wonderful apple tart. I can’t guarantee it will be private, but you will learn a lot! See what the New York Times has to say about Spring. I’ve already shared my thoughts on the little brother wine bar of Inaki Aizpitarte’s famous Le Chateaubriand (129 Avenue Parmentier) and the opinion stays the same. After a month to reflect, it’s still that good. Unfortunately, the guidebooks and reviews are now wrong, you do need to make a reservation, but if you arrive early, at opening around 7, you can probably sit at the bar. See what the New York Times has to say about Le Dauphin and Le Chateaubriand. Following a trend that allows less prepared diners to enjoy a taste of what makes the parent restaurant impossible to book, Frenchie (5 Rue du Nil) opened a wine bar just across the dark little alley from their original Sentier location. Tapas-ified versions of many of their most famous dishes are on the menu, with an excellent wine list. Unfortunately they do not offer wines by the glass, but if you come in by yourself, look at them all doe-eyed, they might relent. Come early, at the 7pm opening, as it will fill up. The service was just okay, and I got the sense that my single status was mucking up their seating arrangements, as well as their no “by the glass” policy. Nevertheless, a lovely couple from Singapore was eventually seated next to me, and it was fun to speak English for a while and discuss not only food, but Occupy Wall Street! Overall, the food made it worth it, especially since I didn’t have to wait. See what the New York Times has to say about Frenchie. The scene of my “last night in Paris” dinner with Jeff Mirek, and it was one of the best. I’ve long been a fan of chef Christian Constant’s food and his many restaurants (including his flagship Le Violon d’Ingres, 135 Rue Saint-Dominique), and he’s considered the godfather of “bistronomique”, a mentor of Yves Camdeborde, and among the first haute cuisine chefs to abandon his Michelin stars (Les Ambassadeur at Hotel Crillon) in favor for a more relaxed approach. Chef Constant sort of owns this stretch of block in the 7th arrondissement near the Eiffel Tower, and also has the fantastic lunchtime counter Les Cocottes, offering a meal and price point for every palate. Cafe Constant is a casual all day bistrot, but the food is as impressive as his more upscale offering Le Violon, but at more humane prices. The space is tiny, but they do have a nice bar at which you can wait for a table. 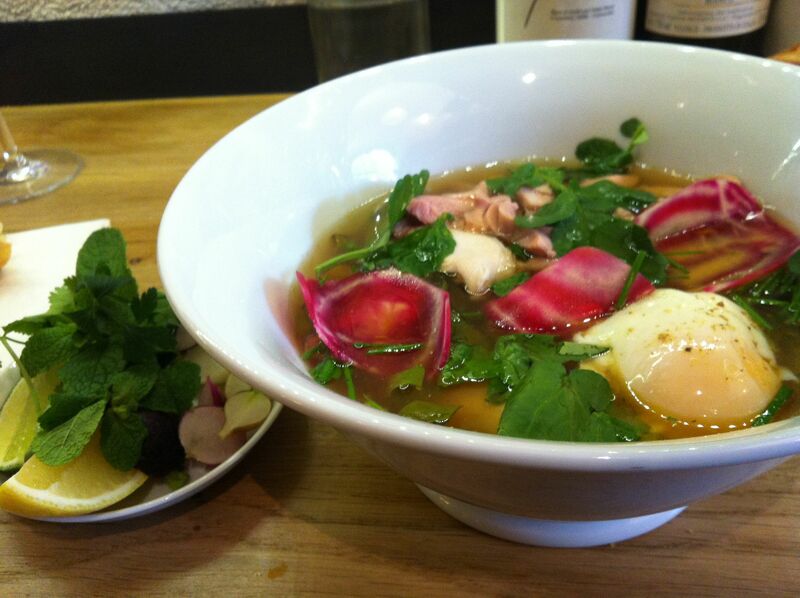 Their daily offerings are full of inventive takes on bistrot classics, and loaded with game. 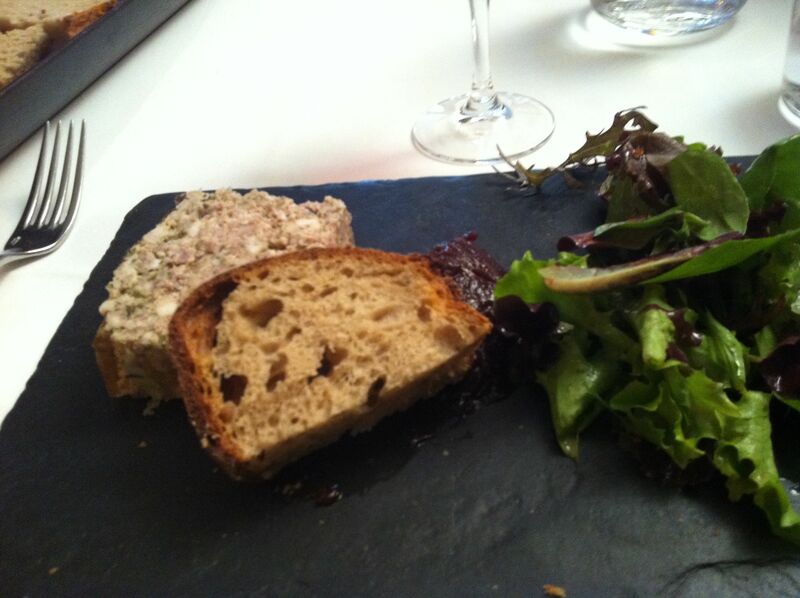 We tried the rabbit starter and I had the roasted wood pigeon and Jeff the duck – domestic fauna beware! 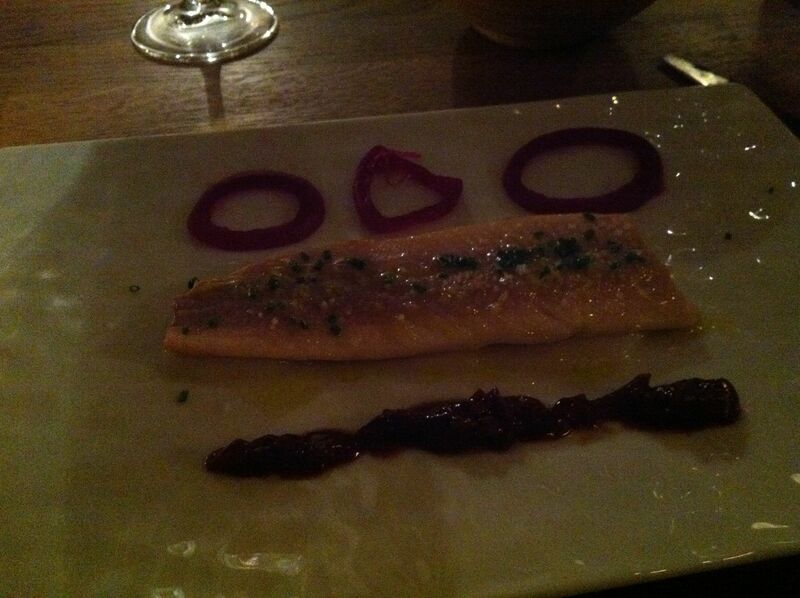 The food was straight-forward, pleasing, and quite delicious. So was the scene from this one lovely American lady waiting for a table outside who said “I want some garlic bread and something with alfredo sauce!” shortly before they seated her party upstairs. Thank you Cafe Constant staff! If you are visiting the Eiffel Tower, make sure to have lunch at Les Cocottes (next door to Le Violon on Rue Saint-Dominique) for a cold terrine in a jar, a hot stew in a Staub cocotte, or the best salade aux lardons et oeuf ever. All dishes are under 10 euros and they have plenty of counter seating. 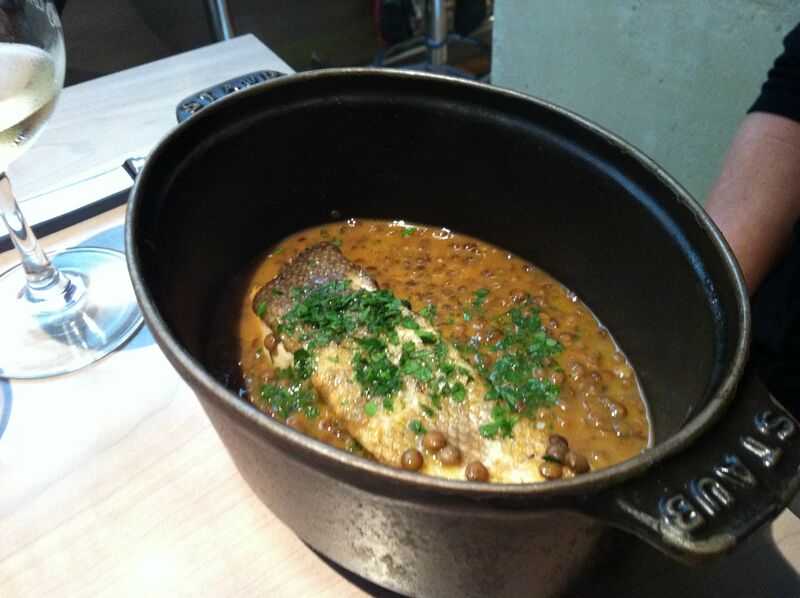 Les Cocotte's sea bass with lentils, "en cocotte"
See what David Lebovitz has to say about Les Cocottes and Mad About Paris has to say about Cafe Constant. I wrote about this wine bar, both the hor d’ouevres and their take away crepes, on StreetMeat, and it’s not to be missed. It’s the little brother of Yves Camdeborde’s famed Le Comptoir du Relais (also at 9 Carrefour d’Odeon), the “neobistrot” that booted the entire “bistronomique” trend into hyperdrive. Again it’s virtually impossible to get a table at Le Comptoir (booking a room at the Hotel Relais, in which it’s housed, helps, or standing in line at lunch or a weekend dinner if you are so inclined) but waltzing into the next door sliver of a no seats wine bar at 3pm, any day of the week, is so easy you might do it every day. Plus for 3-7 euros per dish, you get the nibble on the most delicious bar snacks such as croquettes of Iberico ham, a shellfish bouillon or even a creme brulee. I think I can squeeze one more visit in! UPDATE: Speaking of squeezing one more visit in, I decided I couldn’t leave Paris without giving dinner at big brother Le Comptoir du Relais the old college try. After seeking out Rotisserie Beaujolais in the 5th across from Ile-St-Louis on David Lebovitz’s recommendation, and seeing a desolate dining room with steep prices, I figured if I’m going to spend some cash, I’ll do it at a more upscale joint. Since weekend dinner at Le Comptoir is first come, first serve, I figured if I high-tailed it over there I could beat the rush. Arriving just past half-six, I managed to snag the last open seat outside just as a long queue was forming. 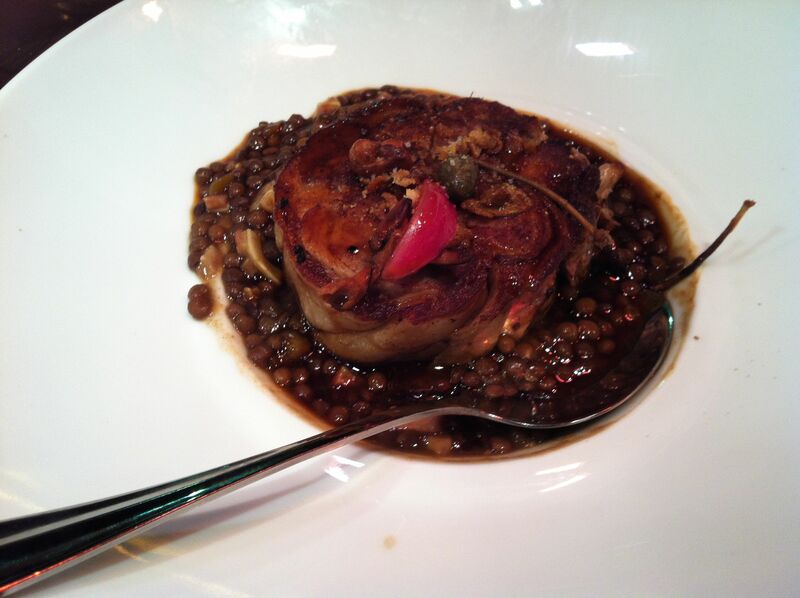 I opted for braised cochon (baby pig) with lentils and a light burgundy. It was very good for simple bistrot standards, but not earth-shattering, consistent with what I’ve been reading in the food blogs about weekend service here. Brave the crowds if you want to gain a notch on your foodie belt and were unable to make a weekday reservation. Something tells me the next time I come to Paris I should plan to stay at Hotel Relais so I can get a table for one of the legendary weekday pre fixe dinners! See what the New York Times has to say about L’Avant Comptoir. When you have to have oysters, go here (months with ‘r’ only s.v.p!) That’s all I’m gonna say, because that’s all they serve (and the occasional shrimp!) 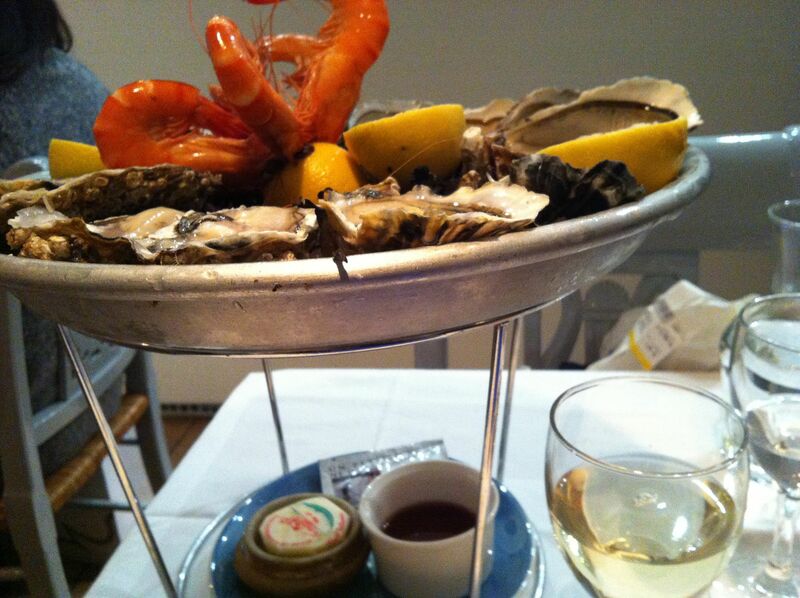 Superb deal to boot – 21-29 euros for a dozen oysters and a glass of muscadet or sancerre. Wines also by the carafe, and some whiskeys too if that’s more your speed! Open everyday for lunch and dinner except Monday, with dinner service starting at 6:30. It’s tiny, so go early, but they will let you hang at the bar to wait for a table. See what the New York Times has to say about Huitrerie Regis. Sometimes all the planning in the world can lead you astray and that’s when you have to call an audible. No fancy parent restaurant led me to this sleek bistrot in the 11th, just a closed Le Chateaubriand, a ’26’ in Zagat an affirmation from Le Fooding, and voila – the best grand lunch of the entire month! I gushed about it earlier, but one thing I neglected to point out was the space. The room was a little granny-ish, but their tableware, including the cutlery, crystal and serving pieces were terribly chic, giving the place the perfect high-low ambiance that I so admire. If it’s well-executed, inventive and satisfying French bistrot fare you desire, less the long waits and foodie pilgrims, look no further than Le Villaret. This is an old review from the New York Times, but the chef is still the same, as are the high standards. Another outstanding wine bar, with a full menu, that is open everyday, I was introduced to this gem my very first night in Paris by fashionable friend Jeannie Lee. Another benefit is bar sitting and we were able to enjoy excellent charcuterie and cheese (their burrata and buffalo mozerella duo with prosciutto is to die for!) as well as sample a few different whites in an otherwise packed dining room. If the seared tuna provençal is on the menu, get it! And if you can’t make a reservation, hold out for a bar seat or sit outside. The relaxed, casual atmosphere is perfect for a post- Louvre or Pompidou visit. 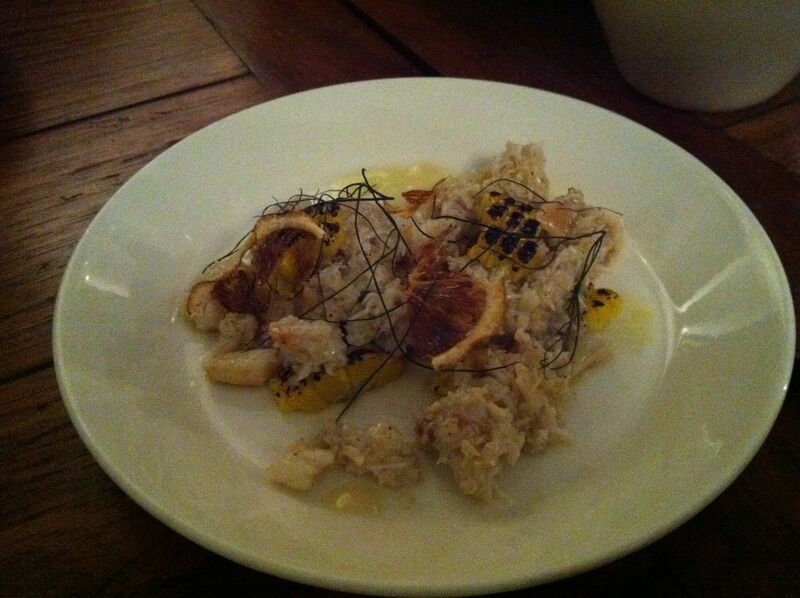 See what Food & Wine has to say about Les Fines Gueles. And stayed tuned for StreetMeat recap!